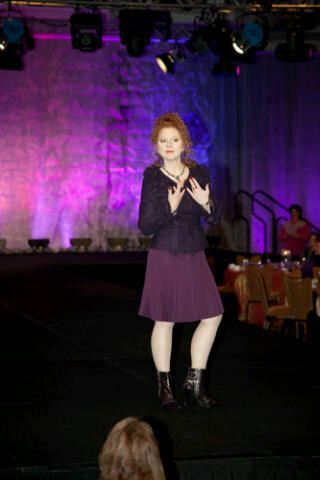 On Friday, I attended a lovely luncheon hosted by the Conrad Hotel for Dress for Success Indianapolis. This luncheon is an annual event that brings together all of the past and present models that have graced the runway at the organization's largest annual fundraiser, Stepping Out In Style. From the spicy shrimp cocktail first course to the delectable dessert to the Aveda goody bags from Evan Todd Spa & Salon, the Conrad gets it right. My fellow "runway role models" also get it right, and there were lots of stylish shoes and inspired ensembles on display! (See Kathy Kightlinger's article about the luncheon in the Indianapolis Star here). More importantly, these women understand and champion the critical importance of raising funds to support this organization that promotes the economic independence of disadvantaged women by providing professional attire, a network of support, and the career development tools to help them thrive in work and in life. This September will mark the eleventh anniversary of Stepping Out In Style - a night of high fashion, great food, critical fundraising and loads of fun! The evening includes a cocktail reception sponsored by Bedel Financial Consulting, Inc., dinner, a fashion show, and an after party sponsored by Citizen’s Energy Group. Dress for Success Indianapolis will welcome community leaders as models to the stage for the fashion show, which features unique clothing from upscale local boutiques. See who's who in Stepping Out In Style 2013 here! If you'd like to join the fun, you can learn more and purchase tickets here. I'd love to see you there! I love your skirt and it looks great with the blue. What other colors do you think you could wear with it? Thanks! I love the site eShakti because you can custom order the length with no added cost. I've only worn it with the blue so far, but I also like it with bright emerald green (I have a pair of emerald and mustard spectators so I'm thinking about trying that combination). To carry it into fall, I think it could be paired with a black or charcoal grey turtleneck and tights. I'm big on choosing pieces that can be paired with multiple combinations. You look great in mustard - I really like the mustard and white striped shirt you got recently - very fresh looking! Buy It In Every Color? !